The Punjab Industries and Commerce Minister Sunder Sham Arora today said that three mega logistics parks are coming up in the Ludhiana district that would act as stimulants for the growth of our industry. He said that logistics has been added in the State Industrial Policy as it is the backbone of our entire industry and cannot be left out. 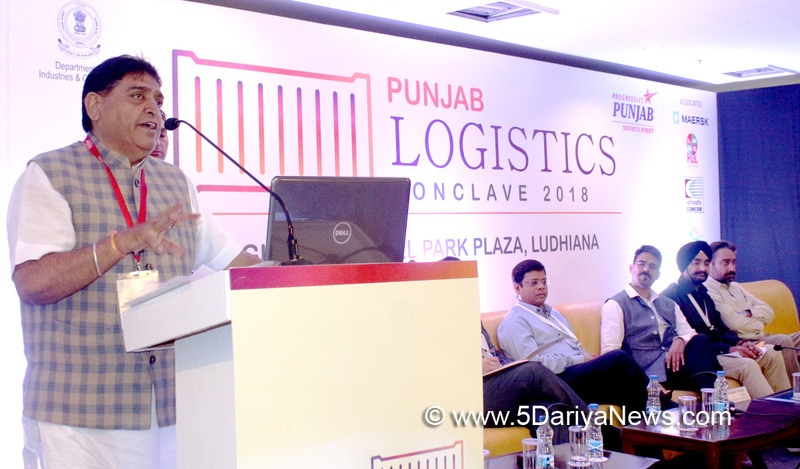 The minister said this while addressing the gathering on the occasion of Punjab Logistics Conclave 2018 at Hotel Park Plaza, here today.Government of Punjab and Punjab State Container and Warehousing Corporation Ltd. (CONWARE) in partnership with Federation of Indian Chambers of Commerce & Industry (FICCI) as Institutional Partner and Deloitte Touche Tohmatsu India LLP as Knowledge Partner hosted the first of its kind Punjab Logistics Conclave 2018, here today.While addressing the gathering, Mr Sunder Sham Arora said that all the three Mega Logistics Parks would be coming up near Kila Raipur village of the district. These include Multimodal Logistics Park by Adani group, another logistics park by Punjab Logistics Infrastructure Limited and a logistics park by Punjab State Warehousing Corporation.The Minister said that these logistics parks would cater to complete logistics need of industrial belt of Ludhiana including industrial hubs located close to regions such as Jalandhar, Amritsar, Bathinda, Sangrur, Patiala, Fatehgarh Sahib and Hoshiarpur. These mega logistics parks would be a one stop solution for all the logistics, transportation , warehousing needs of the region providing complete logistics solutions. He stated that a special cell has been formed by the state government so that the logistics sector is not ignored.He also stated that land banks have been developed by the department in different parts of the state and the state government is willing to provide land at reserve price to the industrialists forming clusters. He said that till now, 25 clusters have been approved in the state and two new clusters have been approved for Oil Expeller Industry of the district.For providing a lease of life for sick industrial units of the state, the Punjab government is coming up with a One Time Settlement (OTS) policy, that would be put up in the next cabinet meeting. He said that the state government is committed for eradicating unemployment by boosting our industry.Mr Arora said that due to the efforts of the Congress led Punjab government, several sick units in Mandi Gobindgarh area have restarted their operations, which is a good sign for the overall industry of Punjab. He said that due to the pro-industry policies of the state government, several industrialists from across the state have been in constant touch with Chief Minister Capt Amarinder Singh and with him as they are willing to invest in the state.Mr Rakesh Kumar Verma, Principal Secretary, Industries & Commerce, Punjab and Mr DPS Kharbanda, Director of Industries and Commerce, Punjab, informed that at present, the logistics costs for industry in India are 14%, while in China its 10%. They said that in next five years, the department is working hard to bring down these costs to 7-8%. They said that during a recent survey, Punjab stands second in the country in terms of logistics infrastructure facilities and by 2020, Punjab would be on number 1 spot. They urged the industrialists to take full advantage of Trade Infrastructure for Export Scheme (TIES) that has been started by the Union government for the benefit of exporters.While addressing a press conference, Mr Sunder Sham Arora said that all cases related to VAT and GST would be cleared by December 2018. The Minister also mentioned that the State is developing a special Warehousing Park in the Zirakpur-Tepla-Rajpura Zone. The Minister said that the objective of this Conclave was to understand the dynamics of the Logistics Value Chain and to identify the gaps in the value chain which would initiate the necessary government interventions to fill these gaps. The Minister also informed that very soon, next such conclave would be organised on leather and sports goods industry in Jalandhar.Mr. S.K. Ahirwar, Director Logistics Division, Ministry of Commerce and Industry, Govt. of India, New Delhi spoke on the latest initiatives of Government of India on the Logistics Sector. The entire program was divided into four sessions, namely 'Government of India and State Perspective on Logistics’, ‘Identifying various challenges being faced by the Logistics Sector within the State and suggesting possible solutions for the same’,‘Economics of Logistics – Discovering Solutions to Move Faster’ and ‘Smart Warehousing- Building the Spaces for Future’.Mr Mahesh Khanna, GMDIC, Ludhiana informed that during today’s conclave, a total of 14 MoU’s worth Rs 869 crore were signed between the industrialists and the Punjab government.